Rizelya, following in the footsteps of her ancestors, uses her fire magic to battle the fearsome monsters that constantly attack her people. They are finally gaining the upper hand until a new, more ferocious monster suddenly appears—one that’s much more difficult to defeat—jeopardizing her people’s survival. Now Rizelya must race against time to discover innovative ways to combat the beasts before her world is overrun. Assaulted by horrific visions of a mysterious enemy behind the thousand-year war, Rizelya must learn the truth about this ancient enemy. Why do they want to annihilate her people? 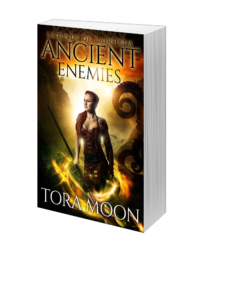 Ancient Enemies is the first book in a series of action-packed, epic fantasy novels. If you like strong female characters, unique monsters, innovative magic systems, and powerful shapeshifters, then you’ll enjoy Tora Moon’s Legends of Lairheim series. “The story line has a good plot and offers a different form of magic that holds the reader’s attention in this amazing epic fantasy where the never-ending struggle between good versus evil takes place. Are you ready to answer the call to battle?